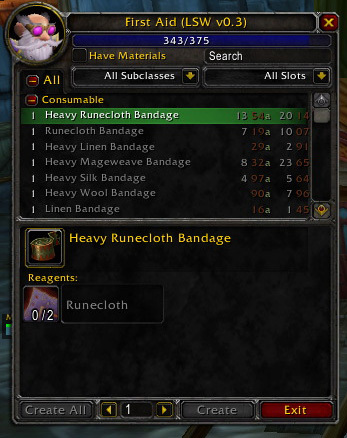 Just a line on item tooltips, down near the bottom where various auction addons put auction prices for items, that displays LSW's calculated material cost, for quick comparison. I often craft a bunch of stuff using LSW as a guide, and then when I get to the auction house, I have to open my tradeskills back up and find the items to decide on appropriate bid and buyout values. I'd like to be able to just look at the item's tooltip to know what the minimum profitable listing would be.